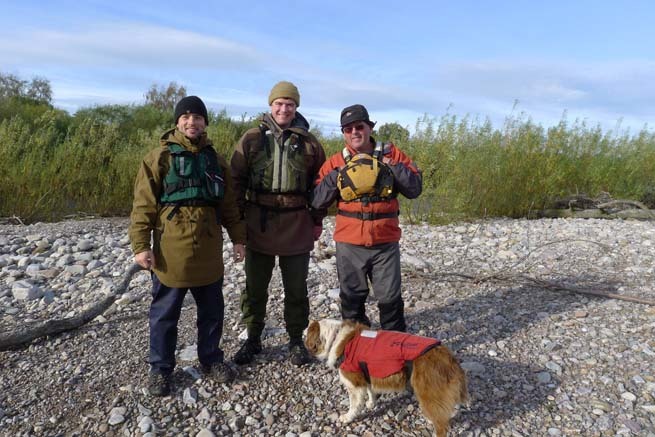 Last week Ben Gray and I joined Ray Goodwin for a canoe trip down the River Spey. Starting at Loch Insh, in the shadow of the Cairngorm mountains, we descended to the sea at Spey Bay over the course of three-and-a-half days. Along the way there was some great paddling and an opportunity to apply a few bushcraft skills. They Spey is one of Ray's favourite rivers and I had been meaning to join him on one of his guided trips for a number of years. Unfortunately, each year I had work commitments that prevented me from joining his group. This year, having had a very busy year with Frontier Bushcraft and www.paulkirtley.co.uk, I set aside the time to make the trip and unwind a little. Ben, a regular canoeing buddy of mine and member of the Frontier Bushcraft team, was also able to make the trip. In addition to Ben and myself, Ray had another four clients on the trip, so there were seven of us in total, which made for a nice group size. Ray also brought his dog, Dillie, so I suppose I should say there were eight of us! 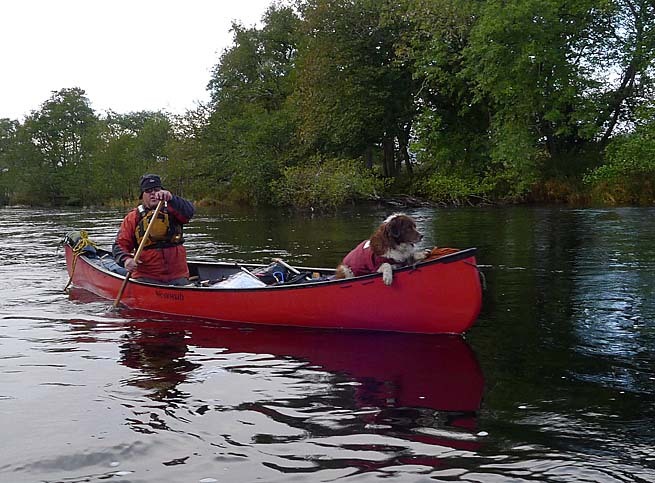 Ray Goodwin and his dog, Dillie, on the River Spey. Photo: Paul Kirtley. On the morning of the first day on the water, we awoke to rain and a fairly chilly breeze. This set the tone for the next few days but we were thankful that the wind was largely at our backs once we left Loch Insh. 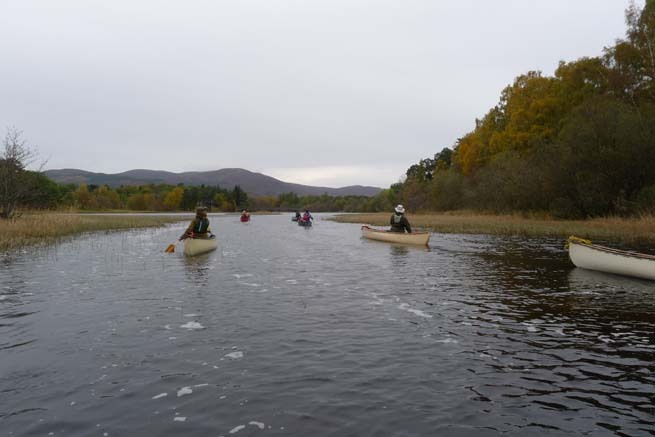 Leaving Loch Insh and beginning our descent of the River Spey. Photo: Paul Kirtley. There had been a reasonable amount of rain before our arrival which provided water levels that were already good. As we descended the river, further rain meant that the river was still rising. It certainly wasn't warm either. The wind continued to be cold and when we did get a glimpse of the mountains, we could see they were dusted with snow down to about 800 metres. While it had been raining where we were, it had been snowing on the hills. Photo: Paul Kirtley. The rain also meant we had some damp campsites. A fire in the evenings made a huge difference to our comfort. It warmed our bones and dried our clothing. Getting comfy despite the pouring rain. Tarp set up and fire lit. Photo: Paul Kirtley. 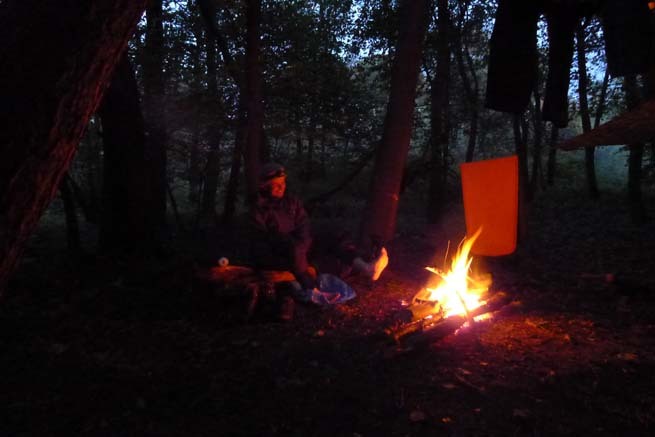 In torrential rain, being able to quickly select a good campsite and set up with efficient campcraft was important. In what was a very damp environment, good fire-lighting skills and material selection were also of key importance. 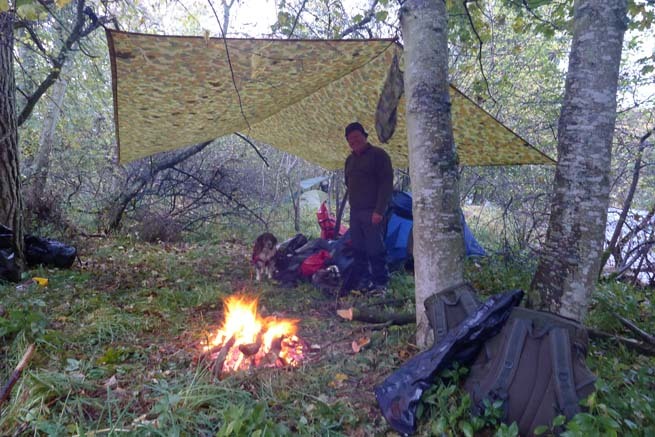 Solid application of elementary bushcraft skills while undertaking real-world journeys such as this make the difference between a miserable experience and a comfortable, enjoyable time in the outdoors, despite the conditions. A warming fire is always welcome at the end of a chilly day. Photo: Paul Kirtley. 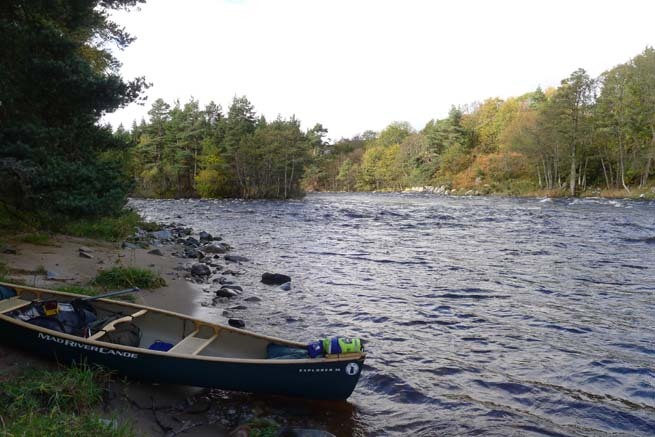 After Grantown-on-Spey the river starts its final descent to the sea and begins to flow with real purpose. This, in addition to some significant tributaries adding further volume to the river, means there are some rapids that must be treated with respect. Ray guided us down the river with the consummate skill and judgement. His experience and professionalism in these situations is always evident. 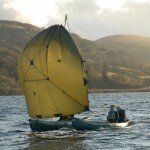 This was a real journey in cold conditions with laden boats. No-one swam throughout the whole trip. Nor did we portage around or line through any sections. Lunch stop below the rapids at Knockando. We'd come around from the left. Photo: Paul Kirtley. 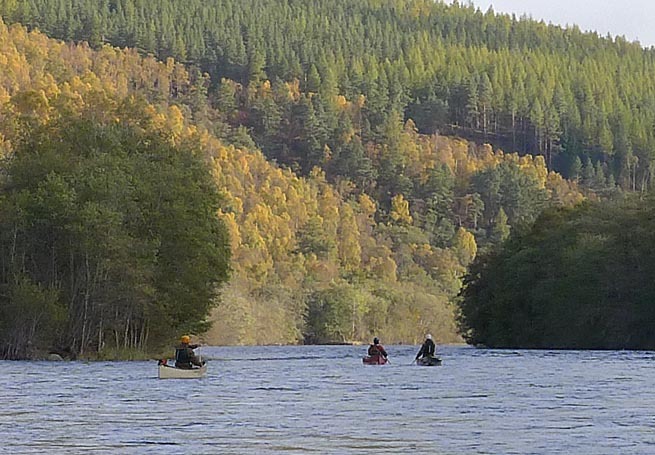 On the final day we were treated to some warming sunshine as we made for our finish at Spey Bay. In the final few kilometers of the river, it flows unconstrained into an outwash plain where the river becomes braided. This is an unusual feature for a British river. Down amongst the shingles and small willows, you could almost have been transported to somewhere much more remote. 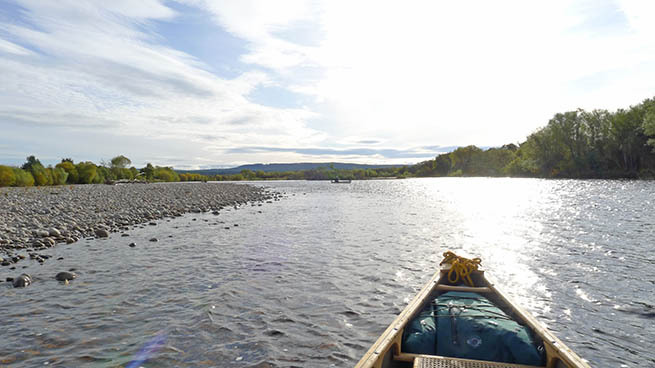 The braided outwash of the last few kilometers of the Spey feel completely untamed. Photo: Paul Kirtley. Just as I was becoming fully absorbed by this special environment, all of a sudden there was the smell of the sea on the air. Soon we passed under the deserted railway bridge near Garmouth and within a kilometer we could see the sea. Right there. Waves breaking in front of us. 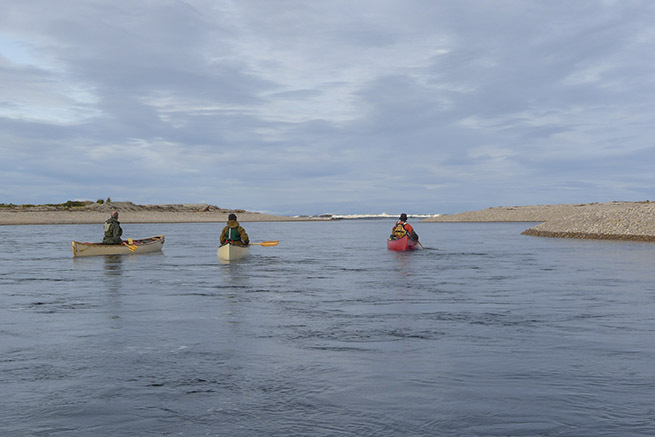 The end of our journey down the Spey, with waves crashing not far away. Photo: Paul Kirtley. This was the end of what had been a relatively short and relaxed but nonetheless full journey: We had travelled from loch to sea via stunning and varied landscapes. There had been exhilarating paddling and an opportunity to use some bushcraft skills to add to our comfort. I enjoyed travelling and camping with everyone in the group and I would like to extend particular thanks to Ray for his organisation and guiding. 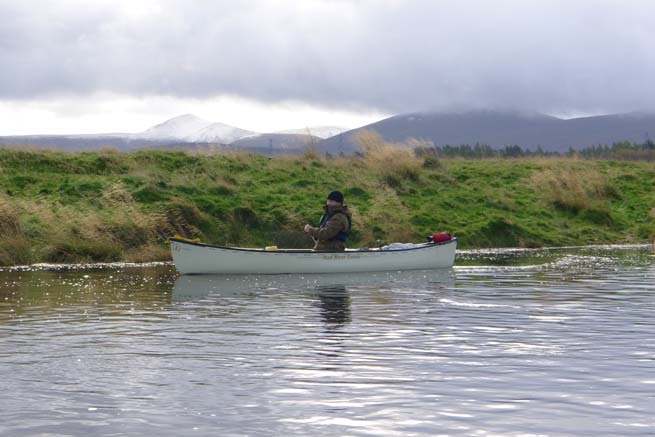 If you'd like to undertake a trip on the River Spey, Frontier Bushcraft now offers trips in conjunction with Ray Goodwin. You can find out more here. The Frontier Bushcraft contingent: (clockwise from left) Ben Gray, Paul Kirtley and Ray Goodwin. A great trip, the trees where amazing that time of year. I do remember snow on my hammock in the mornings. 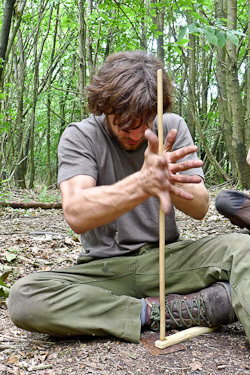 This was the trip that made me want to learn some bushcraft. There where a couple of handy lads on the trip who had been trained by Paul and proved their worth. I just made cakes. I did think that a distillery stop may have been in order, l’ve never pasted so many in my life. Good to hear from you and I’m glad my blog of the trip brought back a few memories for you. We didn’t have snow on our camp in the mornings but it was pretty chilly. Certainly chilly enough to have a few warming drams of an evening. Both Aberlour and Knockando were sampled and found new fans.